What’s Your Use Case For The Powered Speakers? Listening habits today tend to gravitate towards headphones, wireless speakers and mobile devices, but good, old-fashioned bookshelf speakers still have their place. 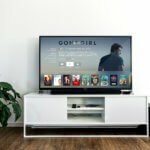 Larger and more powerful than mobile speakers, but much smaller than a full-size surround speakers, bookshelf speakers offer a balance between size and price, but without sacrificing their premium sound quality. There are a variety of space-saving speakers on the market, speakers that not only look good and blend into their surroundings, but deliver excellent, clear audio quality. 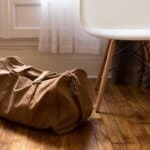 Finding a pair for your room and your budget shouldn’t be too hard. Therefore, we wanted to round-up some of the best powered speakers on the market that can give a budding audiophile a great listening experience. 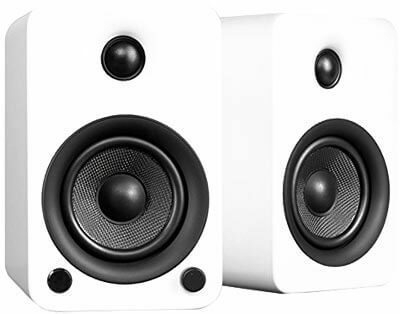 The Audioengine A2’s are another pair of excellent speakers, designed to fit on your desktop and for use with your PC. In addition to their sleek, hand finished wooden cabinets and premium sound quality, they also feature a digital to analog converter (DAC), which allows you to send digital audio directly from your PC via USB cable. There is also a sub-out port for connecting an external subwoofer. Should you wish to go wireless, you can purchase Audioengine’s A3 wireless adapter. The left speaker of the A2 has built-in amplification. Simply plug the right speaker into the left for a full-audio experience. Input options include RCA, 3.5mm AUX and USB; you can hook it up to your PC, phone or TV. At 4”x5”x6”, the A2’s are only about 1/3 of the size of Audioengine’s flagship A5’s, and the perfect size for your desktop. They receive rave marks, even from audiophiles, on their sound. Audioengine’s optional DS1 speaker stands allow you to stand them up on flat surfaces. 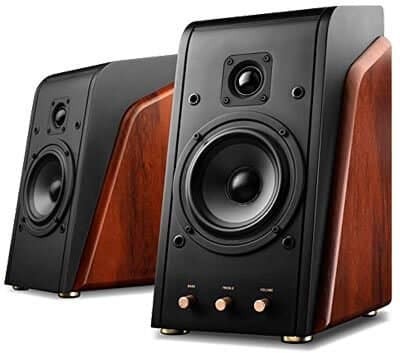 Widely regarded as some of the best sounding speakers in their price range, Audioengine HD3’s are premium set of classy and elegant bookshelf speakers, available in polished black, cherry or walnut finish cabinets. They are compact and portable, measuring 11”x11” and designed to fit anywhere from your bookshelf to coffee table. Bluetooth connectivity and USB input allow for compatibility with all kinds of devices and a range of up to 100 feet, with the option for AUX-cable and RCA input; a Digital Analog Converter (DAC) converts digital signals to analog, bypassing your PC’s built in DAC, for the most premium sound. The HD3’s feature built-in amplifiers capable of putting out 60 watts of power, and when coupled with large Kevlar woofers and silk tweeters, produce brilliant, faithful sound. 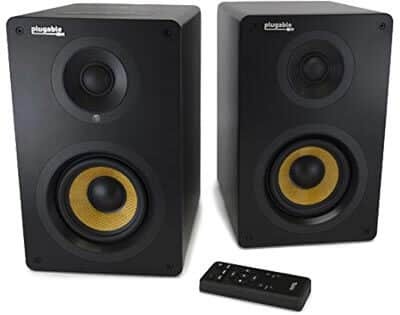 There is a port for connecting an additional subwoofer for top-of-the-line bass, though the built in woofer is more than capable for daily listening. 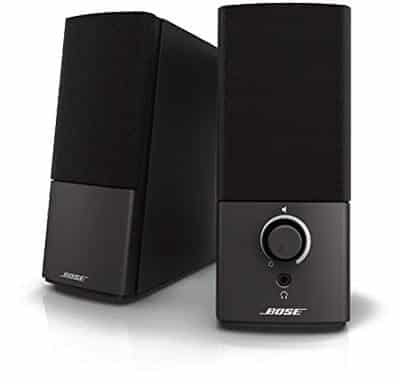 Bose is known for their premium quality speakers and crisp, clear sound, and their Companion 2 PC speakers deliver just that. Designed to be used for PC’s, gaming and movies, the Companion 2’s are sleek, attractive and relatively small, (only 5.9”x7”), blending neatly into your desk or shelf with minimal wires or footprint. The Companion 2’s come with two AUX inputs, so you can hook up both your computer and phone or tablet simultaneously. Volume and headphone jack are right on the speaker. They also feature Bose’s TrueSpace digital processing, which creates spacious, rich and pure sound with deep bass and a high level of detail. If you’re looking for a way to mount the speakers, however, the Companion 2’s do not feature any hardware, as they are intended to keep as minimal a profile as possible. For the price you’re paying, however, they’re a fantastic value. 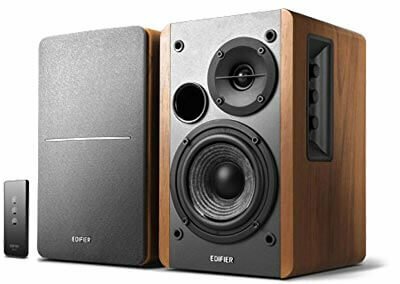 First up are the Edifier R1280T Powered Bookshelf Speakers, an affordable pair of bookshelf speakers with modern, studio-quality sound in a retro package. The perfect size for bookshelf speakers (6”x9”x5”), their classic wood sides and grey grills look fantastic with any décor and paired with a vintage vinyl player. The R1280T has input ports for RCA, and two different 3.5mm AUX inputs. You can connect two devices at once, seamlessly switching between inputs (or playing both, if you so desire). One speaker also has a built-in tone control on the side, allowing you to control the treble and bass from -6 to +6 db. Reproduction and fidelity are high, with low bass and crystal-clear highs – especially for their very affordable price. A cool feature of the Edifiers is their digital volume control, which automatically sets the volume to a comfortable level during power on and avoids any sudden, ear-splitting accidents. 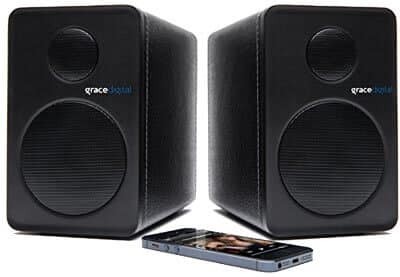 The Grace Digitals are a compact pair of high-quality bookshelf speakers, with a host of different connectivity options, such as integrated Bluetooth 4.0 and integrated RCA inputs. 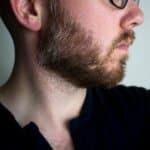 They are based on the Qualcomm APT-X codec, which is designed to be capable of delivering CD quality audio wirelessly through the Bluetooth connectivity – in other words, the audio signal is uncompressed. Their sound quality is comparable to that of a monitor, but in a much smaller footprint. With 36 watts of power and a range of 50hz to 20khz, these are some powerful little speakers for their price. If you’re after wireless freedom, the Bluetooth 4.0 is capable of pairing with up to 8 devices at once with a range of 30 feet. They also include a USB jack for charging your phone. The top panel has a full control panel built right in – volume, playback, audio source controls and Bluetooth pairing button. The Kanto YU3’s are meant to bridge the gap between bookshelf and desktop speaker, providing 30W of power from a built-in Class D amplifier, in each speaker. When coupled with 4” Kevlar drivers and 1” tweeters on each side, the YU3’s put out crystal clear and distortion-free sound. A variety of inputs – two optical TOSLINK ports for lossless digital audio, RCA port, 3.5mm AUX jack and integrated Bluetooth 4.0 with Qualcomm APT-x audio – mean the YU3’s are ready to accept any device. They also feature a sub-out port for easy subwoofer hook-up, and a USB port for conveniently charging your phone or tablet while playing music. The YU3’s are compact, measuring only 5.5” by 8.6”, and fit easily on your shelf, desktop or coffee table. They come in three matte colors – black, grey and white. The YU3’s sound quality is brilliant, and regarded by many audiophiles as nearly indistinguishable from much more expensive speaker systems. If you’re looking for something with serious sound without shelling out the big bucks, the YU3’s are an excellent bet. Willing to shell out a little more cash? 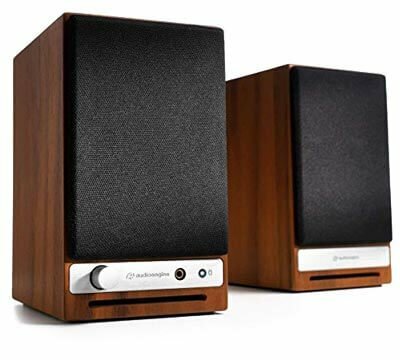 The Klipsch R-15PM’s are premium, elegant speakers, designed to fill a room with beautiful sound. Each speaker includes a 1″ aluminum diaphragm compression driver, paired with 90° x 90° square Tractrix Horn and 5.25″ copper IMG woofer. They also come with an integrated phono pre-amp. Put all these together, and the result is a pair of high-performance monitors capable of producing reference-quality sound. While the R-15PM’s sound and look great, they are far from small and compact. They can be mounted on wall with brackets. A sub-port allows for connecting a sub-woofer for enhanced deep bass. 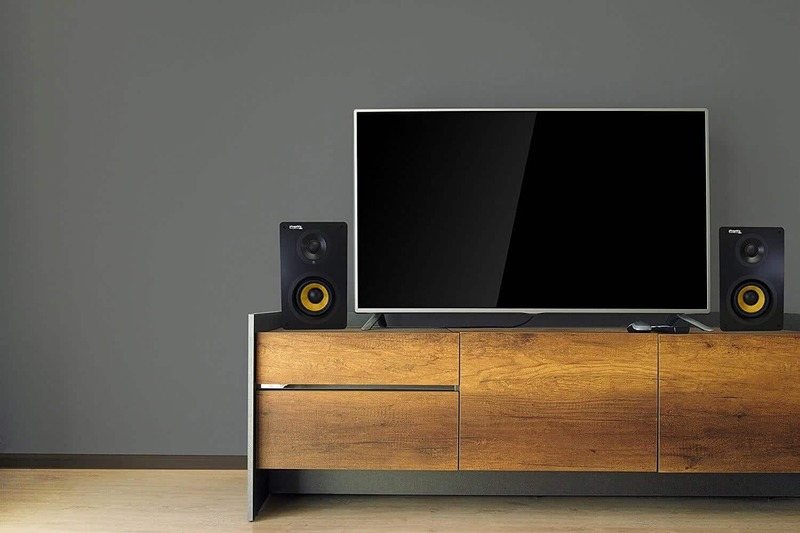 Connectivity options include Bluetooth, digital optical TOSLINK, analog RCA and even USB, meaning these speakers are suitable for everything from TV’s to PC’s and tablets. If you’re a fan of vinyl and aren’t on a budget, you can also grab Klipsch’s matching turntable to complete set. An included IR remote features controls for dedicated source selection, track controls, play/pause and volume. 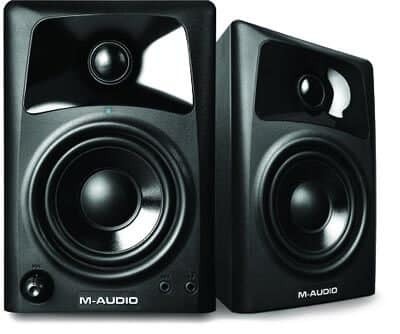 M-Audio produces quality studio monitors and amplifiers for professional use, and they’ve taken that same quality and commitment to sound and put it into their M-32 speakers, a professional grade set of bookshelf speakers that are as at home producing media as they are for entertainment. They feature 3” woofers, with 1” tweeters, as well as OptImage IV waveguides for crisp, balanced audio with both good bass and brilliant highs. Their built-in amplification provides 10 watts per channel, while the speaker cones are uncovered for pure, unobstructed sound. In addition to the standard RCA input, The M32’s front panel features a headphone output, as a well as a 1/8th stereo input, meaning they are compatible with all your devices. 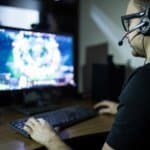 They are ideal for producing music at home, but work great for gaming, movies and just listening to music. 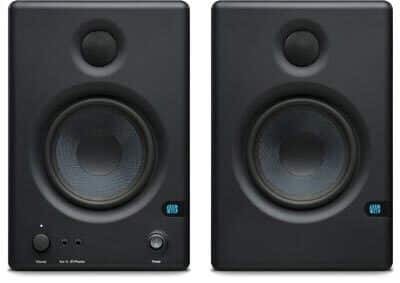 Mackie CR5BT’s are slick, modern and attractive, designed to deliver sound accurate enough not only for entertainment but for home recording and mixing as well; “CR” stands for Creative Reference. The CR5BT features a 5” built-in woofer and delivers 50 watts of power. Input options include RCA and 3.5mm AUX, as well as wireless Bluetooth 4.0, so you can connect your phone, tablet, PC or TV. The front panel includes a headphone jack as well as AUX in, volume control and On/Off switch. 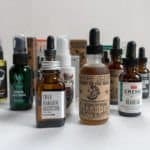 They are the perfect size for a bookshelf or desk, their black finish wood cabinets and green trim blending in nicely and not taking up too much space in a small room or apartment. Sound quality is fantastic for the price, delivering high bass and flat frequency response that recording enthusiasts appreciate. Their quality is superb for entertainment purposes, and more than adequate for audiophiles and musicians recording at home. This fantastic pair of Bluetooth bookshelf speakers from Plugable is intended for easy, hands-free home use with phones, tablets, and computers. Each speaker cabinet features both a 4” glass fiber cone subwoofer, as well as a 1” silk dome tweeter and 55-watt Class D, 2-Channel Amplifiers. The Plugables are capable of reproducing sounds anywhere from 55-20khz, resulting in accurate, well-balanced sound. Even the most discerning of audiophiles enjoy their quality, and say it is more than expected at the Plugables price point. The built-in Bluetooth 4.0 allows for hands-free convenience, is capable of up to 512 kbps, and features the Qualcomm apt-X codec for superior wireless sound quality. The Plugable’s also come with standard RCA ports for analog sound, as well as the option to use TOSLINK optical cables. The Plugables are handsome bookshelf speakers, and their modern, sleek aesthetic goes well with any room. Ideal for PC’s, gaming and home theater use, the Presonus’ Ceres are based on studio monitors but designed to fit anywhere in your home. They feature 3.5” Kevlar low-frequency transducers, as well as a 1” ultra-low mass silk dome, high-frequency transducer. Each side delivers 25-watts of Class AB amplification, and the final product is balanced and crisp studio-quality sound, accurate enough for home recording and luxurious listening. Connectivity options include RCA and ¼” balanced rear inputs and a front panel 1/8” Aux input, as well as a front headphone jack. There is also Bluetooth connectivity, so you can enjoy listening to your phone or tablet in wireless freedom. The Ceres also has a sub-output, giving you the option of an external subwoofer if you need more bass. The front panel has Bass and Treble Acoustic tuning controls, for finely tuning to your liking. The Presonus Eris are big brothers (or sisters) to the Ceres, intended more for studio use and featuring a larger, more powerful transducer (4.5”) while lacking the Bluetooth capability. They still put out 25 watts per side and have the same 1” tweeters. They also come with studio acoustic tuning controls, for Mid-range, HF, High Pass, and Acoustic settings, to achieve maximum accuracy when mixing and recording. It also comes with RF interference output limiting, over temperature and transient and subsonic protection. As the Eris are intended as monitors, the back panels have both XLR and RCA inputs. They do have an AUX input on the front panel for when you wish to hook up your phone or PC. They do, however, include Bluetooth or any wireless connectivity. The Eris put out a 100 db continuous SPL, and have a 70khz to 20khz frequency response. 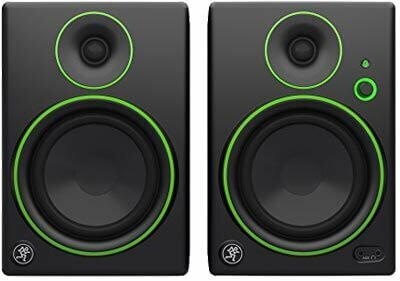 Bass is good enough that many don’t consider a subwoofer necessary, and the sound they provide should be good enough for all recording and mixing purposes, and more than enough for home use. 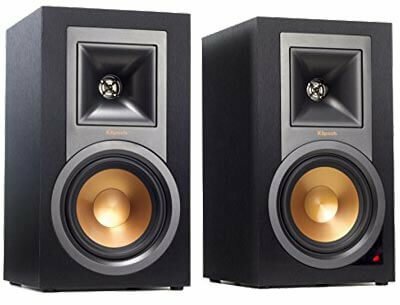 The Swans M200KII’s are a high-end, high-quality pair of speakers, meant to bridge the gap between classic Hi-Fi speakers and modern devices. Originally designed as a compact monitor for studio use, the latest incarnation of the M200 is intended for use with phones, PC’s and entertainment devices. Their rich brown wood finish and knit grilles evoke a timeless and retro style, while the wooden panels provide substance and support to the cabinets and lead to a deeper, more balanced sound. With 5” woofers, MK200II’s are capable of serious quality sound, reproducing anywhere in the range of 56hz to 20hz. Harmonic distortion is equal or less than 1%. The front panel includes controls for volume, bass and treble. The back panel has only RCA input, but the speakers do come with an AUX-to-RCA adapter for use with phones, PC’s and tablets. They are not Bluetooth-compatible and lack any kind of wireless connectivity; the plus side of being wired, however is that they are capable of only the highest quality sound. For their price, they are a luxurious, high-end speaker that will add some classic cool to your listening room. When looking at speaker systems, you’re going to come across two main types – Powered and Unpowered. 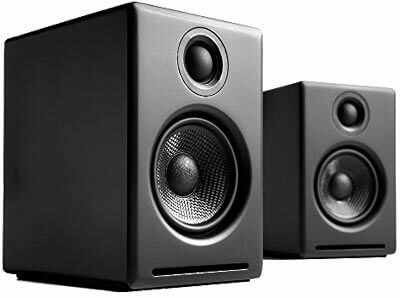 Powered speakers have their own amplifiers built into the speaker, therefore, they don’t need a separate receiver/amplifier to play audio. 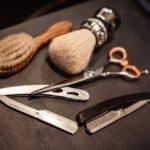 All you need to do is plug them into the closest power outlet, connect the music source, and you’re ready to go! 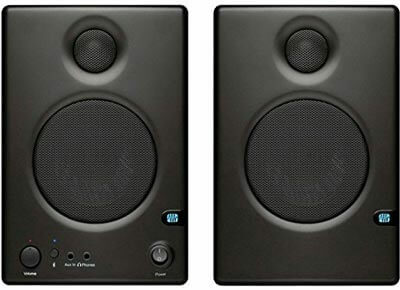 For this reason, they are especially great for those looking to just dip their toes into a quality audio experience without needing to know all the nuances to setting up a perfect sound system. 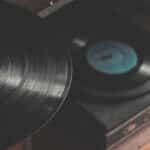 They are also fantastic for budding vinyl collectors, who want the full experience and rich audio from their records but are not quite ready to pay for all the bells and whistles. Powered speakers will come at a higher price point than unpowered speakers (with some high-end options starting around $250, as reviewed above). Once you add the additional required components for a barebones unpowered speaker to work, such as receiver/amplifier, cabinet, speaker wire, etc. the cost of the two will end up being quite comparable (if not more for the unpowered speakers). Naturally, unpowered speakers with all their required accessories, will take up substantially more room. When it comes to powered speakers, you will find that many of them come with a varying degree of audio input options. As you can see above, all of powered speakers listed in this article have at a minimum, a standard headphone jack (aka AUX input). Therefore, if you are using a smartphone with the legacy headphone jack (or thunderbolt to headphone jack dongle), you can simply plug your phone directly into the speakers and begin playing your favorite tunes immediately. This connection port will naturally be the least power consuming on your phone and will provide the best in uninterrupted quality audio. Contrary, if you like to live in a wireless world, many of the powered speakers do come with Bluetooth integration as indicated in our chart above. 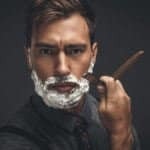 Most will have a range of about 50′, which will allow you to easily walk around the house with your phone without ever dropping the signal. Many of the manufacturers have decided not to include a remote if the speakers are Bluetooth capable. 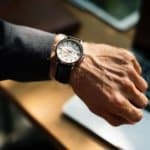 While this may make sense from the onset, especially if you are playing music from your phone, if you are using an alternate audio source (such as a turntable), you will still have to get up every time to adjust the sound level. Therefore, if you want the ultimate in audio control while still retaining Bluetooth functionality, the highly-rated Plugable powered speakers are going to be among the most versatile powered speakers on the market. The beauty of powered speakers is that they are incredibly compact and to some extent, portable. Therefore if you are currently living in a dorm or small apartment, any one of the above speakers will be more than enough to completely fill the room. But long after the late-night studying sessions are over and you find yourself upgrading (one day) to a house in the ‘burbs, the powered speakers will likely be getting replaced by a much richer sound system. When they do, these will be perfect for a sweet basement setup or even a compliment to your PC gaming rig. For the most versatility years from now, be sure to check out the mounting brackets on the powered speakers. 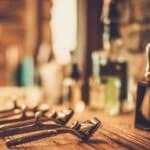 This will allow you to affix them to a stand or wall for extended use several years down the road.